Ontario research shows an average of 7.5 bushels more wheat. Add in improved winter survival and a more uniform stand and you have an agronomic no-brainer. Stooped over a seed trench late at night, squinting through the beam of a flashlight at dark grey soil, Alan McCallum still doesn’t doubt how worthwhile starter fertilizer is for a wheat crop. In fact, if McCallum figures if he doesn’t see grey fertilizer in the seed trench, it’s worth putting the brakes on winter wheat seeding no matter how ominous the forecast or how late in the fall it is. In his mind, starter fertilizer is that important. He is a crop consultant in Elgin County and recommends to all his clients that they use starter fertilizer, including when he helps his brothers plant winter wheat. Some of the plot work McCallum and his brothers did a few years ago showed a yield response of up to 19 bu./ac. on lower testing clay soils. On old pasture ground, where you tend to have lower background phosphorus levels, the yield response can be even greater. That’s what Peter Johnson, cereals specialist with OMAFRA, sees too. “Seed-placed starter fertilizer, on average, can produce a 7.5 bushel yield increase,” he says. With $7/bu wheat, the payback on $800/tonne phosphorus is obvious, says Johnson. The economics of adding starter is better in this environment than when phosphorus was $600 and wheat was $4/bu. Johnson has done experiments with liquid fertilizer. He put down boards over rows of wheat and found that if you’re only applying 2.5 gallons/acre of liquid fertilizer, you might as well save your money. “The problem is that with that low a rate you’re getting a drop here and drop there so there’s a whole bunch of seed going down with no phosphorus,” says Johnson. “Maybe if we had more even distribution it would make a difference. Liquid fertilizer is good and convenient, but expensive. If you’re set up for liquid starter fertilizer already, Johnson suggests trying 5 gallons of fertilizer with 5 gallons of water to reduce costs but maintain good distribution. Adding sulfur and zinc to phosphorus in a starter fertilizer, such as through the MESZ product, doesn’t do much on winter wheat, says Johnson. He says sulfur appears to disappear over the winter. If you’re set up for dry starter fertilizer delivery, Johnson says 50lbs of MAP is good, but 100lbs, of course, is better. When looking at rates it depends on your equipment capability. Johnson says that based on just two years of data, potash on wheat is less important than on corn and soybeans. But he says don’t drop potash to zero. Starter pays. No question. But anyone who hasn’t invested in an air cart in the past 10 years will tell you feeding wheat at planting isn’t the easiest job. Growers also got away from starter because it’s hard on equipment. For all kinds of reasons, an air cart is the simple answer. Newer air carts have a split box with a compartment for seed and another for fertilizer. Most are made of plastic now, which doesn’t rust. Air carts allow blending of fertilizer at a reasonable amount – 100 pounds of MAP with wheat seed for excellent response. If you don’t have an air cart and just a single box drill, you can blend the phosphorus and seed while augering everything into the box. It’s harder to be accurate with rates using this method. Blockage monitors on an air seeder will howl if one tube is completely blocked. But with McCallum’s setup, because it’s just a blockage sensor and he’s running two different products through the tube, one primary tube might be blocked at the metering roll but seed is flowing through fine. McCallum and his brothers would like to get individual monitoring on each tank. That way they’d at least know they have material flowing through each of the primary hoses. Starter fertilizer convinces a wheat plant that it has enough nutrients to push out more tillers than it otherwise would. That’s important, because each tiller can produce a head and more grain. Phosphorus is the main reason wheat responds to starter fertilizer. It’s critical to wheat metabolism for photosynthesis and respiration. Most yield-forming tillers are made in the fall. Some tillers will start to form before freeze up but fail to develop, so it’s very important to use starter fertilizer if wheat is planted late. Looking for Tillers? 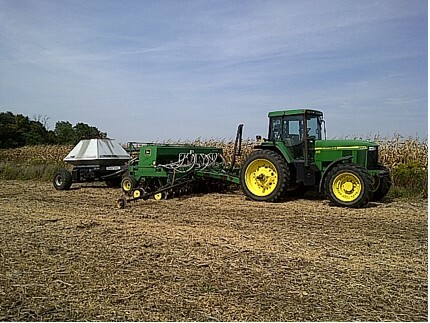 Consider Early Season Nitrogen Management!